They’re all interconnected. Although one dimension is usually dominant – maybe you’re trying to solve a problem or come up with a plan (mental), or find a mate or bond with your teenager (emotional), or run a marathon or declutter your house (physical), or ascend to a higher state of mind or connect to some cause or movement bigger than yourself (spiritual) – the achievement of this goal involves the other dimensions as well. 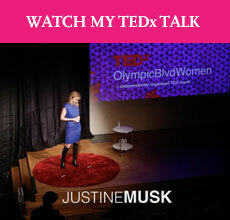 I am preparing a talk to give at TEDXWomen in Los Angeles on Dec 5 – which is coming up maybe faster than I would like. I want to crush it. The big goal (crushing it) chunks up into smaller goals, each involving one of the dimensions. Mind: I outline, write, and then revise the talk for maximum impact. I think about my big idea, my supporting ideas, and the intellectual shift I’d like to create within the collective mind of my audience. Heart: I touch base with the organizers of the event (Dana and Kristan), who keep tabs on how the talk is progressing. (TED controls the brand pretty tightly.) I practice my talk on friends and family and any other innocent spectator unfortunate enough to be standing nearby. I receive coaching and suggestions. I think about the kind of connection I want to form with the audience. I aim for a certain kind of emotional impact and structure my talk accordingly. Body: I practice – over and over – giving the talk. When the day comes I haul myself to the appropriate location, deal with my nerves, hope I wore the right outfit, act like I’m more confident than I am. If I’ve rehearsed enough, the talk will be trained so deeply into my body that it will take over once I am onstage, no matter how nervous I am. Soul: I seek a connected and creative state of mind. I want to walk away from this experience feeling like I’ve both grown from it, and contributed to the growth of others. (That would be incredibly cool.) I am part of a community. We get in trouble, I think, when the different parts of ourselves are not aligned. Instead of building on each other towards a single point, they are in conflict. They pull us in different directions. They disrupt our focus and scatter our energy. The mind urges you in one direction, but the body rebels and suddenly it’s difficult to get yourself out of bed. The heart yearns and gnaws on itself and spins you off into distraction, loneliness and daydream. The soul feels ignored and starts closing in on itself: you descend into a state of resentment, bitterness, alienation. Every goal has four dimensions. I’ve always thought that the soul controls (feeds, frees, nourishes, et. al.) the heart, and the heart controls the mind, and the mind controls the body. It goes the other way as well, but with less impact. Meaning, if you exercise, you have a more positive outlook that benefits yourself (mind), humanity (heart) and the universe (soul). The more we are connected with ourselves, others, and God, the more truth and beauty we will have in our lives, and the more truth and beauty we will be able to give others. Life is not about what you get, but about what you give. Enjoy crushing your TED talk! Please do post a link whenever it gets up on the inter-webs. Oh damn, i’m coming to LA to lead a writing intensive on Dec 8th and was going to arrive on the 6th…now you make me want to bump my trip a day earlier. Hmmmmmmm…. Would *love* to see you speak. As I travel and grow in my personal journey – attempting to find a natural balance of mind, heart, body, and soul; I find it hard to believe the number of people (40 something generation) traveling aimlessly without a clue that there’s a link or even a purpose in exploring these essential elements of the human perspective. Stop, heal, and seek inward before pursuing the the next step.